A ferocious storm has swallowed the village of Beacon Cove – and from the ruins of the storm’s horrid aftermath, the ragged survivors rebuild around the lighthouse, overlooking the watery grave of the once proud fishing village. Weatherworn, proud and defiant, the survivors are still here, as the notes on how the folk look and dress explain. The pdf also sports lore to unearth for the PCs, and no less than 6 different events and 6 whispers and rumors that can be unearthed by PCs with the proper social skills. These, obviously, also can also be used by the Gm to add some neat complications to the subject matter. The pdf also provides a proper marketplace section for consumables or crafting services, which is a nice plus. The survivors also fear supernatural things behind the horrid occurrence that has forever changed their ways and the worship of the sea queen Serat is also touched upon as a brief sidebar. The inn comes with proper prices for accommodations and food/drink and with a hard daily life and continuous downpours on the verge of normalizing, the place is most definitely an intriguing one – the great b/w-artwork depicting the place is inspiring and daily life also is covered in a helpful sidebar. Mike Welham delivers big time here: This place of power is not only inspired, it can be spun in a variety of ways by the enterprising GM: Whether supernatural or group delusion, this somber place is basically an adventure in disguise and as such, it basically begs for the PCs to be dropped in and watched – speculation will run rampant sooner or later, doing the work for the GM. This is a great place and yet another example of Mike’s abundant talent. As a very minor complaint: This is, to me, technically closer to a village (or rather: thorp) than a Place of Power and as such, the place could have used settlement stats, but that may be me. Similarly, I would have loved to see magical properties for the place. 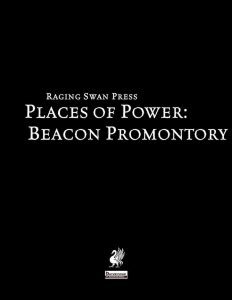 Don’t let that keep you from this cool locale, though: This promontory is an amazing set-piece that breathes the spirit of Raging Swan’s flair in all the right ways. My final verdict will hence clock in at 5 stars. You can get this cool, evocative locale here on OBS!